Oregon, like all programs, open the season with a series of scrimmages. There are the refereed inter-squad, closed-doors variety, which take place prior to the Spring Game some time in April. There is the Spring Game — at Oregon, the Green and Yellow game, at Michigan State its the Green and White, Nebraska hosts the Red and White, et. al. that is open to fans, usually features a draft held by team captains, pits the QB 1 vs. the QB 2 and generally provides some expectation-driven excitement (or, in the case of Marcus Mariota, very real excitement) as well as some awesomely collegiate blunders and some unique situations1. But unlike all programs, save the big ones, Oregon then occasionally has the benefit of playing two or three more scrimmages before the season starts. These one’s are of the refereed variety as well, but instead of playing against themselves, QB’s donning red jersey’s and plays being blown dead due to “assumed contact,” these scrimmages cost $60 a pop to attend, feature sad opponents from little-known conferences and are cleverly disguised as competitive college football. Hey, NCAA. We know the truth. Shhhhhhh. All is forgiven, though, we’ve made it through the tedium that was Early September. No. 3 Oregon kicks off conference play this week against a No. 21 Arizona team that finds themselves ranked in the Top 25 much earlier into RichRod’s tenure than most anticipated. In this unlikely first test for the Ducks, there is still plenty to prove. 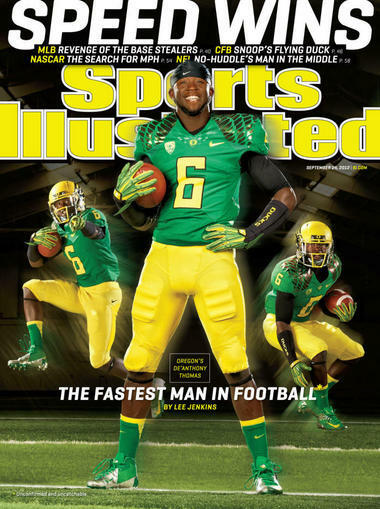 Oregon’s first team has handled their inferior competition righteously up to this point, Marcus Mariota has been a pleasant surprise (although his Week One shine is slowly beginning to dull), De’Anthony Thomas is on the cover of Sports Illustrated and between Taylor Hart, Isaac Remington and Dion Jordan, the Ducks defensive line looks fierce. But all is not exactly groovy at Autzen. John Boyett, a preseason All-America selection and the Ducks leading tackler two of the last three seasons is lost for the year. So is captain Carson York, the nimblest guard in the nation. Marcus Mariota has looked sharp for the majority of his snaps, but he’s yet to be tested by a tough defense and has still made some freshman mistakes — which isn’t ideal for Oregon coming into Pac-12 play down a key O-Lineman. But Oregon is still Oregon, and it’s not like Arizona’s defense (61st in Total Defense) is the 2000 Baltimore Ravens2 or anything. Besides, defense doesn’t figure into play with these two. Never really has. Marcus Mariota vs. Matt Scott — On paper, Arizona’s Matt Scott looks like the superior quarterback. His 331.67 yards per game are good enough to rank him sixth in the nation in passing offense. Mariota is averaging just 244.67 yards per game and hasn’t outperformed Scott in any statistical measure thus far. It would be reasonable to give the edge to Arizona. Stats don’t lie right? In this case, they might. The paper has warped Mariota’s impact on the Duck’s offense, displaying stunted numbers and assigning rankings that, if anything, should read as incomplete. In his first three games as the starting quarterback’s, he’s piloted the Duck’s to 50, 35 and 35-point first-halve’s, respectively. Against Arkansas State, he barely made it to the second quarter. So yes, his stats are stunted in comparison to Matt Scott, but they are stunted by his own success. Don’t expect that comparison to hold for much longer — Mariota should be making it all the way to the fourth quarter any day now. Matt Scoot might have ripped apart Oklahoma State, but that was at home. Good luck checking down in Autzen sometime around 8:30 p.m. PST, after the newly-arrived student body has had a full day to “prepare” for the first conference game of the season. Scott isn’t Nick Foles yet, and even Foles couldn’t figure it out. Edge — In a close one, Mariota is the man. Kenjon Barner/De’Anthony Thomas vs. KaDeem Carey — In what appears to be another casualty of success, Carey has been delightful for the Wildcats and has out-rushed Barner through his first three games. But Barner, like Mariota, is having trouble staying on the field for all the right reasons, i.e. scoring lots of touchdowns. While Carey and Barner’s yards per carry are identical (5.8 to 5.8), it’s important to note that Byron Marshall, Barner’s backup, has already gotten 37 carries in garbage time — carries that would have normally gone to KB. De’Anthony Thomas is the ultimate Wild Card, Ed Norton’s Ace of Spades tattoo in “Rounders,” the knife that all pre-20th century cinema protagonists (and antagonists alike) keep tucked in their boot. He is the bayonet at the end of the musket, the Undertaker’s Tombstone, the ultimate backbreaker. As bleacherreport.com’s Bryan Kalbrosky so brilliantly wrote this week, “he’s more athletic artist than a football player.” Get this: Through just three games, the aptly named Black Mamba has averaged 15.9 yards per touch. And on those offensive touches, of which he has received just 24 this season, he’s managed to score seven times. Don’t bother, I’ll do the math. 29 percent of the time De’Anthony Thomas’s fingers grace a dimpled leather surface, he scores. And, more and more, and more and more and more, he has been proving that the only thing pushing the ball away from the endzone (i.e. the ultimate goal) does to for him is pad his stats. He turns 92 yards into 40 so quickly that DVR might as well be rebranded as a De’Anthony Translator. He’s so good that RichRod essentially pleaded with him to turn pro before Saturday’s game. In the words of the immortal Paul Bettany, in the indelible A Knight’s Tale, We have the opportunity, nay, the privilege of watching you DAT. So sorry KaDeem, you have been officially Mamba’d. Edge: Thunder and Lightening. QB Marcus Mariota, WR’s Keenan Lowe, Bralon Addison and De’Anthony Thomas vs. CB’s Jared Tevis and Jonathan McKnight — This could be the biggest matchup of the day. Oklahoma State QB Wes Lunt found out just how hard it was to find open receivers with these two ballhawks lurking off the in the distance. He threw three picks during Arizona’s upset win, two to Jared Tevis and one (a pick six) to Johnathan McKnight. If these two can assert themselves early on the outside and take Lowe and Addison out of the game, then Oregon could be in some trouble. Even more troubling? The only receiver on the Ducks with more than 100 total yards this season is De’Anthony Thomas (154). I know DAT’s listed twice, and that’s because he as versatile on offense as he is light on his feet: Nearly half of his touches have come on passes in the slot. If he’s the Duck’s lone option, however, don’t expect him to be open for long. Mariota, like Lunt, is young and compulsive; two qualities that McKnight and and Tevis feast on. Edge: McKnight and Tevis. DB’s Dior Mathis, Boseko Lokombo, Ifo Ekpre-Olomu & Company vs. WR’s Austin Hill, Dan Buckner and Richard Morrison — This is another scary matchup for the Ducks. Arizona has a proven core of wideouts (unlike Oregon sans Josh Huff), which, thankfully for them, are matched up against a decimated Oregon secondary. I already mentioned the absence of Boyett, their rock in the defensive backfield, but even against grossly over-matched competition, Oregon’s pass defense was porous (and that’s generous). They are 43rd in pass defense (68th in run defense, but with these two it’s best just to chalk up 200 yards per side on the ground and move past it) and that number doesn’t figure to improve as Pac-12 conference play heats up. Sure, they’ve managed a few interceptions, assisted on some sacks with solid downfield coverage, but until they do it against a real, live team, Oregon’s defensive backfield leaves something to be desired. Edge: Arizona’s WR’s. Chip Kelly vs. Rich Rodriguez — RichRod is back, baby! Runnin’ and gunnin’, shooting first, asking questions later. His face is finally starting to de-calcify, allowing that weird, twisted, Charlotte-Pickles-y grin that had gargoyled during his tenure at Michigan to soften a bit. In fact, dare I say it, The RichRod Who Stole Christmas smiled. Since arriving in Tuscon his heart has grown three sizes and Rudolph chauffeurs him to work in the morning. Or at least that’s what his demeanor is telling us. He even cracked a joke in the week leading up to this game, telling the Tucson Citizen, “I remember when he was coming out of high school and we were trying to recruit him. Had a few conversations with him on the phone. So there’s that. But the scary thing is, RichRod might have gotten his Morgantown Swagger back (think Austin Power’s Mojo, only more Appalachia-y). He has a running back (KaDeem Carey) that plays a lot like Steve Slaton; he has a quarterback in Matt Scott who might kind-of-a-little-bit remind him of Pat White; and he no longer has to live up to that weird “Michigan Man” standard, you know the one that is beyond ambiguous, yet still defended as if the code were written on Bo Schembechler’s tombstone or something1. I don’t like Cocky RichRod. The only think I like less than Cocky RichRod is cold McDonald’s french fries. Enough about RichRod. This battle isn’t about RichRod (even though I made it so). We have Chip Sun Tsu matched up against General Custer-Rodriguez-Until-Proven-Otherwise. RichRod has been a nice(ish) story, but he hasn’t met up with a Chip Kelly yet. Edge: Chip. On a final note… I wouldn’t be surprised if, in similar fashion to Stanford in 2011, this game started out tight, a blow-for-blow fight. It might even stay close into the third quarter. But so long as Oregon can keep space in-between their receivers and Arizona’s sticky-fingered DB’s, this game should be a two-plus touchdown win for the Ducks. My Prediction: Oregon 49, Arizona 31 with the Over (78 1/2).